Created in the mountains of Colorado in 1997, Heavyweight Dub Champion is a musical entity here to reclaim sacred space through ritualistic performance and sonic alchemy. HDC communes with Warrior Spirits in the creation, production and performance of their vibrational healing aural mandalas. Their debut album, “Survival Guide For the End of Time” won numerous awards in the State of Colorado, including Westword Magazine’s Colorado Album of the Year. Their upcoming release features multiple tracks with KRS ONE, Killah Priest, Dr. Israel, Apostle, Stero Lion, Elf Tranzporter, Wailer B, Lady K, and others. All music falls under a specific credo described in the Last Champion Manifesto, included in “Survival Guide.” The mission of Heavyweight Dub Champion and Champion Nation is the Unconditional Liberation of the Human Race. All music is created from scratch by the sonic shamanistic alchemists: Resurrector, Patch, and Totter Todd. “Survival Guide” features scratching by DJ Hot Daddi 36-O and their as of yet untitled follow-up album features scratching by DJ Illnaughty. “Survival Guide” is available online from Itunes and CDBaby, among other sources. Its been said that on a Friday afternoon in Humboldt County, you do not even need a radio to hear the sounds of Reggae music. That is because a majority of the radios that are on, are tuned into the “Reggae Jamdown.” For two hours, positive vibrations and a continuous mix of Roots, Dub, and Dancehall flow from the university campus to reggae lovers near and far via airwaves and internet. Despite the geographically isolated location, Humboldt County has a relationship with Reggae music that runs as deep as the roots of the ancient Redwood trees that surround the area. The region hosts one of the most well respected Reggae music festivals outside of Jamaica, and is an essential stop for musicians touring the West Coast throughout the year. 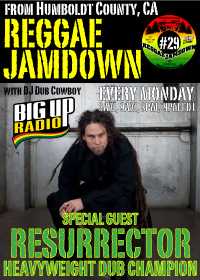 The “Reggae Jamdown” comes to BigUpRadio.com from the fertile hills and valleys of Northern California built on a tradition of community supported radio and an authentic love for Reggae music. Look forward to starting your week with big tunes from past, present, and future mixed by DJ Dub Cowboy and special guests. DJ Dub Cowboy makes home with his wife and children in Arcata, California at the Northern end of Humboldt County. He is a recent business graduate from Humboldt State University specializing in radio and video production. In between spinning records on the radio and in the clubs he is planning a carbon-neutral DJ studio to be based in Arcata. More mixes, more love, more FIRE!! !